Although dwelling values have started falling in Sydney, the city remains substantially more expensive than the other capital cities. 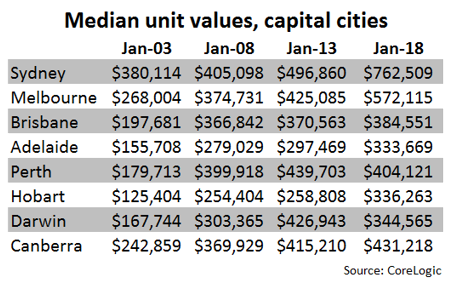 In fact, whether you look at the cost of houses or the cost of units, Sydney stands out as being much more expensive. The above chart clearly highlights how the cost of a house is substantially higher, despite the recent value falls, than the cost of a house across each of the other capital cities. 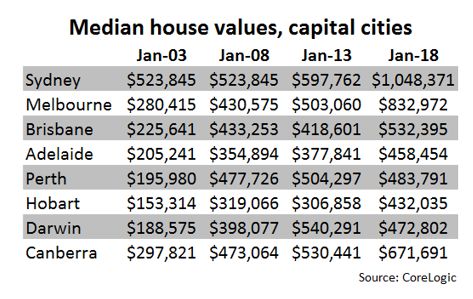 The chart also highlights the much greater escalation in house values in Sydney and Melbourne over recent years relative to the other capital cities. Over recent years, housing costs in Sydney and Melbourne have become demonstrably more expensive than those elsewhere. Some drivers of this have included but not been limited to an undersupply of new housing (Sydney more so than Melbourne), high rates of migration to each of these cities, stronger economic performances of NSW and Vic relative to other states and territories and significantly greater employment opportunities in Sydney and Melbourne than in other capital cities. Although values are starting to fall in Sydney and Melbourne, most of these drivers remain for both Sydney and Melbourne. In fact migration is picking up into Qld but to-date there has been only moderate increases in values.